This post is about generating a special type of light, squeezed light, using a mechanical resonator. But perhaps more importantly, it’s about an experiment (Caltech press release can be found here) that is very close to my heart: an experiment that brings to an end my career as a graduate student at Caltech and the IQIM, while paying homage to nearly four decades of work done by those before me at this institute. First of all, what is squeezed light? It would be silly of me to imagine that I can provide a more clear and thorough explanation than what Jeff Kimble gave twenty years ago in Caltech’s Engineering and Science magazine. Instead, I’ll try to present what squeezing is in the context of optomechanics. Quantization of light makes it noisy. Imagine a steady stream of water hitting a plate, and rolling off of it smoothly. The stream would indeed impart a steady force on the plate, but wouldn’t really cause it to “shake” around much. The plate would sense a steady pressure. This is what the classical theory of light, as proposed by James Clerk Maxwell, predicts. The effect is called radiation pressure. In the early 20th century, a few decades after this prediction, quantum theory came along and told us that “light is made of photons”. More or less, this means that a measurement capable of measuring the energy, power, or pressure imparted by light, if sensitive enough, will detect “quanta”, as if light were composed of particles. The force felt by a mirror is exactly this sort of measurement. To make sense of this, we can replace that mental image of a stream hitting a plate with one of the little raindrops hitting it, where each raindrop is a photon. Since the photons are coming in one at a time, and imparting their momentum all at once in little packets, they generate a new type of noise due to their random arrival times. This is called shot-noise (since the photons act as little “shots”). Since shot-noise is being detected here by the sound it generates due to the pressure imparted by light, we call it “Radiation Pressure Shot-Noise” (RPSN). RPSN was studied decades ago, in the late 70s and early 80s by scientists in the Soviet Union (Vladimir Braginsky, Sergey Vyatchanin, Farid Khalili, …) and Caltech (Carlton Caves, Kip Thorne, …). In a sense, it has really been part of quantum mechanics since the beginning. Heisenberg’s microscope thought-experiment and his derivation of the uncertainty principle that considers the momentum imparted on an electron by a photon measuring its position is based on radiation pressure. In the last few years, remarkable experiments with cold atoms from Berkeley (Dan Stamper-Kurn’s group) and work with solid mirrors from Cindy Regal’s group at JILA in Colorado, have finally measured this effect (incidentally, both groups are led by former Kimble post-docs). Squeezed light is a type of light that can’t really be explained by the simple particle picture outlined above. Quantum mechanics is confusing in this way: a mental picture involving familiar concepts like particles or waves typically misses some important points. In the end, the truth is in the equations. In quantum mechanics, the limits to uncertainty and noise usually come in the form of products. Heisenberg’s relation is a statement about the lower bound on the product of the uncertainties in the position and momentum of a particle. For light, a similar relation exists for the fluctuations in intensity and phase. Phase is a concept that helps us describe wave properties, and it really doesn’t make an appearance in the solely particle-based picture explained above. One physical manifestation of the effect of phase in waves is the fact that waves can interfere constructively (in-phase) and destructively (out-of-phase). Destructive interference is the basis of how noise-canceling headphones work: they sense the environmental noise, and generate sound waves that are exactly out-of-phase with it, so the environmental noise entering a wearer’s ear is cancelled out. The fluctuations of light can be reduced using a very similar feedback and interference process. Conveniently enough, the feedback in the case of optomechanics doesn’t need special signal processing circuits; it occurs automatically. The mirror both senses and modifies the fluctuations of the light. The light we bounce off the mirror causes the mirror to vibrate. But these vibrations are correlated to the way the photons are coming in – they are correlated with the fluctuations of the intensity of the light, which can exist solely due to the quantum nature of light. On the other hand, the phase of the light that comes back from the mirror depends on the position of the mirror. In this way, we “transform” the intensity fluctuations of the light into phase fluctuations. The intensity of fluctuations of the light are reduced (below the “vacuum limit”) while the noise in the phase increases. The light is “squeezed”. Thus the Heisenberg uncertainty limit between intensity uncertainty and phase uncertainty isn’t violated, but we have light that allows us to make better measurements at a given intensity of light. It was exactly this property of squeezed light – the fact that it can possess less intensity noise, which made it interesting to those who were thinking about the limits of measurement and communication in the late 70s. It was realized by then that the sensitivity of interferometers, which were being designed for the Laser Interferometer Gravitational Wave Observatory (LIGO), could be improved, if it were possible to have a source of squeezed light. This led to an intense experimental effort, and the demonstration of squeezing, with Jeff Kimble’s group at the forefront of these advances. Interestingly enough, it took almost 20 years, until the mid-90s, before it was noticed that an interferometer with a movable mirror, like those used in LIGO, could be used to generate squeezed light through the process described above. It took another twenty years of technology development, and significant advances in mechanical and optical resonators design and fabrication techniques, often led by researchers at Caltech in the groups of Michael Roukes, Keith Schwab, Kerry Vahala, and Oskar Painter, before we were at the point where this measurement was possible. For such a Caltech-centric endeavor, it is ironic that my co-authors and I conceived of our experiment during an extended stay in Austria. Simon Gröblacher, a senior post-doc in our lab, and I were working together in Vienna in the spring and summer of 2012, experimenting with optomechanical resonators at very low temperatures in the laboratory of Markus Aspelmeyer at the University of Vienna. The vibrant scientific community there meant that often visitors would come through, and one of these visitors was Prof. Klemens Hammerer from Hannover. Klemens explained the basic difficulties with squeezing, and strongly encouraged Markus, Simon, Oskar, and I to pursue experiments. I had read the papers on squeezed light previously, including an earlier experiment with cold-atoms from Dan Stamper-Kurn’s Berkeley group, but was generally skeptical about our prospects of seeing the effect, and whether it would be an interesting research topic to pursue in a serious way. The first aspect stopping us was the “retooling” required to see the effect: Squeezing would be easier to measure with “floppy” structures that respond easily to the RPSN forces imparted by light. Such floppy structures would have lower frequencies, down to the megahertz (MHz) range. Much of our experimental success centered around the techniques we had developed to shield mechanical resonators from their environment. 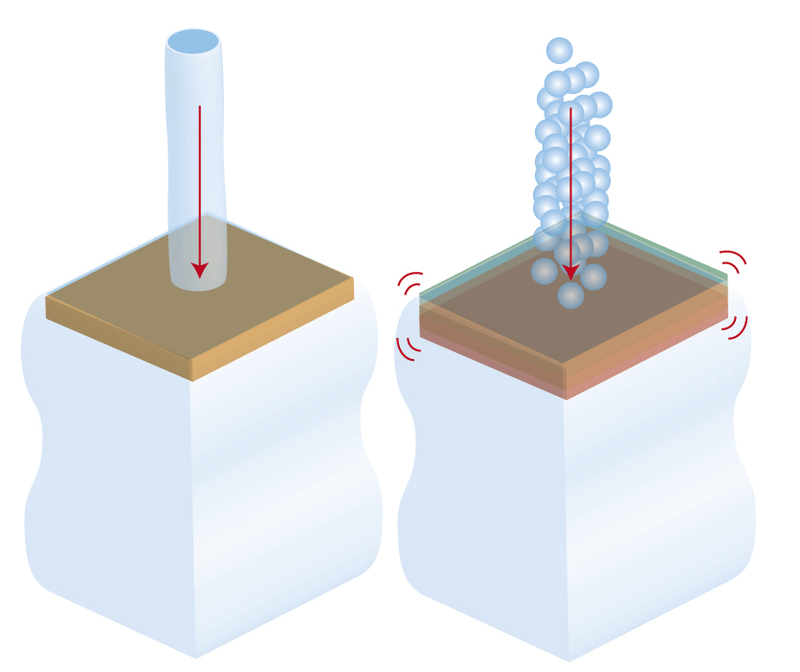 These techniques, which worked well for high frequency gigahertz (GHz) resonators, had allowed us to cool our systems to their ground states, and measure the absorption-emission asymmetry due to the zero-point motion of the mechanical system (see Jorge’s beautiful animated exposition of that result, here). Going to low frequency resonators meant abandoning these techniques, and to make matters worse, at lower frequencies, the mechanical system would sense a larger amount of thermal noise (more phonons) at the same temperature. Thus, the prospects of getting our low frequency resonators to their ground states were dim, and we had spent little effort developing that technology. Surprisingly, cooling the system to its ground state isn’t a prerequisite to generating squeezed light. We found through more detailed calculations that it was only necessary to make the force due to RPSN comparable to the random thermal noise forces imparted on the structure. Another aspect of squeezing that had held us back was that after 30 years of experiments with squeezed light, people had gotten very good at generating large amounts of squeezing using nonlinear materials. It would be hard for us to even compete with Jeff Kimble’s early experiments decades ago, let alone the newer results from Roman Schnabel’s laboratory in Germany demonstrating light 20x quieter than vacuum – an incredible feat, with direct applications to LIGO and GEO600. Nonetheless we had some notion that using a “boring” linear material to generate squeezing could be of interest, though no particular applications realistically came to mind. In any case, at the time, we were pursuing what we believed to be more interesting results with high frequency (GHz) mechanical resonators, and there simply wasn’t enough time to take a detour to lower frequency devices. It had been over a year since our last successful experiment, and our lack of success certainly wasn’t due to a lack of effort by our team consisting of Jeff Hill, Jasper Chan, Simon, and me. We had hit some unexpected roadblocks. That summer, there also happened to be a conference in Vienna called QCMC 2012. Even though Simon and I were more interested in staying in the lab, Oskar’s presence, and Markus’s encouragement meant that we often ended up going to many of the sessions. It was here that Oskar and I met Prof. Warwick Bowen from University of Queensland (another former Kimble post-doc), and had a series of very interesting conversations at a café in the park nearby. We learned of results from his group in Australia, which demonstrated extremely novel applications of squeezed light applied to sensing particles and even living organisms. One idea that made a big impression on me was their work showing that for certain types of measurements of real physical systems, where the intensity of light that can be used is fundamentally limited (as it would cause water to boil, or yeast to die), squeezed light is the only possible way to observe certain physical and biological phenomena. (relevant results from their group can be found here and here.) With such applications in mind, the idea of being able to generate squeezed light on a chip made of silicon suddenly became much more appealing to us (…or maybe it was the mounting difficulties we were facing in our other experiments…). There were two main technical problems (or “challenges” as Markus would say) with which we were faced. The first was making a low-frequency (MHz) mechanical resonator in silicon, which would be well-isolated from its environment, i.e., possess a large Q factor. The other was getting light in and out efficiently to the system via fibers. While Simon and I were in Vienna, Jeff Hill had been working in the cleanroom at Caltech making new coupling structures. This was an effort we had invested nearly a year of work into, and had hoped to apply to the Vienna experiments. On my way back from Vienna, I stopped by a Gordon Research Conference near Boston, where Oskar was giving a talk. Here I met Jeff Thompson, a graduate student, and Nathalie de Leon, a post-doc, both from Misha Lukin’s group at Harvard. They had also been working on coupling light to photonic crystals via fibers. Oskar and I discussed their methods with them, and realized that they were using a technique called “adiabatic coupling”. This was a method invented in Bell Labs in the 1950s, but one that we had only briefly considered in our lab. It seemed to be working for Jeff & Nathalie, so we decided to flatter our colleagues at Harvard in the sincerest way possible: through imitation! The day that I got back from the conference, I came straight into the office with my suitcase, and went directly into the lab. Jeff, Simon, and I designed, fabricated, and tested a new generation of couplers (which luckily ended up being only a minor modification of what we had developed over the previous year). We created new optical fibers to test them, and within a few weeks, we had a highly efficient and robust fiber-device coupling method, that was almost an order of magnitude better than what we were using before, and completely compatible with our previous methods. Jasper designed a new optical cavity, which was more compatible with low frequency resonators, and I worked on tweaking its mechanical properties to make it possess a higher quality factor. About a month later we had fabricated the structures, and they seemed to work, though the mechanical resonators didn’t seem to perform very well surrounded by air. One night we heard that the machine we used to make our structures at the Kavli Nanoscience Institute was going to go down for repairs. Simon, sensing the danger, and with great encouragement from the rest of us, went into the cleanroom well past midnight on that night and fabricated our last set of samples. These would be the ones used in the experiment. With our nanofabrication capabilities severely limited, we were ready to do experiments. After some weeks of calibration and measurement, we were ready for the big event. We put the chip in vacuum and started the cooling process (using liquid Helium). Then we went off to the Rathskeller bar at the Athenaeum to put in our bets over a few beers as to how the experiment would go. As a hedge, I made a bet that the quality factor would be around 15,000, not quite high enough to do the experiment. The quality factor, which informs us as to how strongly the environment affects the mechanical system, had been measured in air to be a few hundred. In vacuum, the Q factor of previous samples seemed to be around 9,000, which was already significantly higher than we had expected. To be able to see squeezing, we needed a quality factor of roughly 20,000. I don’t remember all of the bets exactly, but we had all expected the low-temperature quality factor to be at best, less than 50,000. When we got back, we measured a quality factor of over 700,000 (this later deteriorated over the next few days to 150,000). Our system was capable of observing squeezing! The next couple of months were spent completely in the lab. Simon, Jeff, and I, measured, re-measured, and calibrated everything, everyday, working around the clock. By mid-November we had unambiguously seen the signatures of squeezing, and had managed to successfully convince Oskar (often our harshest critic) that we knew what we were doing. We had observed on our detector that the noise level would drop by around 5% when the light bouncing off our device was sent in. This was a minuscule amount when compared to other competing technologies, but nonetheless enough to demonstrate the potential of our device. (Just a few of months later, Cindy Regal’s group at JILA demonstrated squeezing of around 33% using a silicon nitride membrane). In early December 2012, I presented our unpolished results at the Friday IQIM seminar. The high point of my graduate student career occurred on that day, as I proudly presented our work to a broad IQIM audience, which happened to contain some of the pioneers of quantum measurement – people like Farid Khalili and Sergey Vyatchanin, who had started this long and fruitful journey nearly forty years ago. This entry was posted in Experimental highlights, The expert's corner and tagged Caltech, Jeff Kimble, light, LIGO, mechanical resonator, quantum noise, squeezed by amirsafavi. Bookmark the permalink.